The safety of everyone using the pool is important. Protect your friends, visitors, family and all swimmers from injury with this No Diving warning sign. This easy-to-read NO DIVING sign will prevent any injuries caused by a shallow pool. Sign can be used indoors or outdoors. Rated for 7-plus years of non-fading outdoor use. 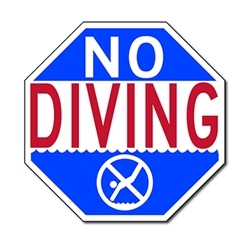 Compliant 4" Inch Tall letters on the word "Diving"
DOUBLE the working life of your No Diving Signs by adding 3M Protective Overlay Film (POF)! 3M’s high-tech POF protects sign faces against fading caused by the sun and harsh weather—and makes graffiti and sticker defacement damage easy to clear away without harsh abrasives.